Texas A&M says the private, graveside service for George H.W. Bush’s family members has ended and the former president has been buried. Thursday evening’s ceremony concludes days of funeral activities honoring the 41st president. 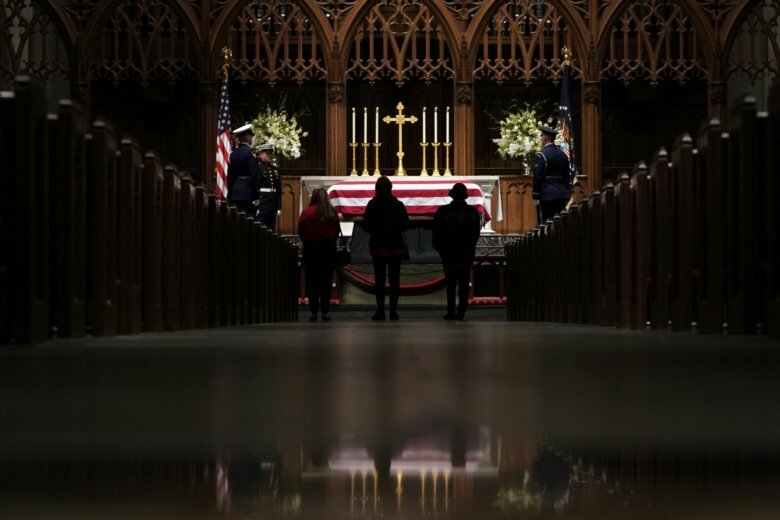 After lying in state at the U.S. Capitol and a funeral at Washington’s National Cathedral, Bush had a funeral at the Houston church where his family worshipped. President Donald Trump says the memorial service in Washington this week for former President George H.W. Bush was a “beautiful tribute” to an extraordinary life. Trump on Thursday noted Bush’s passing at the start of a Hanukkah reception at the White House. He and first lady Melania Trump attended Bush’s state funeral service on Wednesday sitting next to the other living former presidents. Trump called Bush a “wonderful man” and a “beloved American patriot.” He made the remarks as a special funeral train carrying Bush’s casket approached its final stop near Bush’s presidential library in Texas. The Navy has honored former President George H.W. Bush with a 21-plane flyover in a missing man formation before he’s laid to rest alongside his wife and daughter. The flyover was performed as an honor guard, close friends and relatives accompanied Bush’s casket to his family’s burial plot. The flag draped over the casket will be presented to Bush’s daughter, Doro Bush Koch. Former President George H.W. Bush’s casket has arrived for burial in his family’s plot on the grounds of his presidential library in Texas. An honor guard Thursday carried Bush’s casket down the steps of a special funeral train that arrived in College Station after a roughly 70-mile (115-kilometer) trip from suburban Houston. Former President George W. Bush and other family members stood on the Texas A&M University campus as a band played the school’s “Aggie War Hymn” fight song. The 12-car train also carried Bush’s close friends and family, including former President George W. Bush. It was the eighth funeral train in U.S. history and the first since Dwight D. Eisenhower’s death nearly a half-century ago. People who turned out to pay tribute to former President George H.W. Bush as a special funeral train carries his body to the city where he’ll be buried are leaving coins on the tracks to be flattened into keepsakes. A 54-year-old Texan who served in the U.S. Air Force during “Operation Desert Storm” is among the many people who turned out to watch the special funeral train carry former President George H.W. Bush to his final resting place. Kevin Gulley, who lives in Cypress, traveled to nearby Pinehurst on Thursday to see the train carrying the casket of his former commander-in-chief. It is taking Bush’s body for burial in the family plot at his presidential library in College Station. Gulley wore a blue jacket with “U.S. Air Force” embroidered in gold lettering on the back and had a button reading “Looking Great for ’88” on his lapel. He said he wanted to pay his respects to Bush. Gulley stood waiting next to his son’s former football coach, 56-year-old Bill Powers. The two ran into each other here waiting for the train. Crowds have lined the route of the special funeral train that is taking former President George H.W. Bush to the city where he’ll be laid to rest. People waved American flags and cheered as the number “4141” train passed by on its roughly 70-mile (115-kilometer) journey from the Houston suburb of Spring to College Station. Bush will be buried later Thursday during a private service in the family’s plot on the grounds of his presidential library. The number “4141” train that left the Houston suburb of Spring during a light rain Thursday afternoon was painted to resemble Air Force One. It will take 41st president’s casket, family and close friends about 70 miles (115 kilometers) through five small towns on a journey that’s expected to take about two-and-a-half hours. About 1,200 people attended a funeral service for the 41st president earlier Thursday at St. Martin’s Episcopal Church in Houston, which is where the family worships. The hearse carrying the body of former President George H.W. Bush has arrived at a Union Pacific facility north of Houston, where his casket will be placed on a special train that will take him to the city where he’ll be laid to rest. People lined the route from St. Martin’s Episcopal Church in Houston to the train facility in Spring to pay tribute to the 41st president, who died last week at age 94. A procession carrying the body of former President H.W. Bush is slowly making its way through Houston following a funeral at his family’s church. The motorcade is headed to a Union Pacific facility north of Houston, where a special funeral train will take Bush’s casket, family and close friends to College Station for a private burial service at his presidential library. A Secret Service detail is accompanying the hearse that’s carrying former President George H.W. Bush to his burial site. Jim McGrath, a spokesman for the Bush family, says a Secret Service car is following the hearse as it travels from Houston to the city of Spring, where the casket will be placed on a special funeral train that’s headed to Bush’s presidential library at Texas A&M University in College Station. McGrath says Bush’s Secret Service detail will remain with him until 6 a.m. Friday. The family of George H.W. Bush is headed to a Union Pacific facility to join a special train that will carry the former president’s casket to his final resting place. Bush’s relatives, including son George W. Bush and his family, left St. Martin’s Episcopal Church in Houston following a funeral that was attended by about 1,200 mourners. It will be the eighth presidential funeral train in U.S. history and the first since Dwight D. Eisenhower’s body traveled from the National Cathedral in Washington through seven states to his Kansas hometown of Abilene 49 years ago. Abraham Lincoln’s funeral train was the first, in 1865. Country music star Reba McEntire has sung “The Lord’s Prayer” at the Houston funeral service of former President George H.W. Bush. The Grammy winner on Thursday followed the Oak Ridge Boys, who were one of the president’s favorite musical acts and who sang “Amazing Grace” during the service at St. Martin’s Episcopal Church in Houston. Bush’s longtime pastor ended the homily with the same prayer used at the president’s 1989 inauguration. George P. Bush told mourners Thursday that the former president would challenge his grandkids to games like “the first to sleep award.” The line drew laughs at St. Martin’s Episcopal Church in Houston, where the Bush family worshipped. Former Secretary of State James Baker remembered his longtime friend George H.W. Bush as having “had the courage of a warrior but the greater courage of a peacemaker” during an emotional eulogy at Bush’s funeral in Houston. Baker began the eulogy Thursday with an apology. Using the nickname “Jefe,” which is Spanish for “boss,” Baker said he was going to brag about Bush, even though the former president hated boasting. After the casket reached the altar , attendees stood and sang “The Star-Spangled Banner” during the Thursday morning funeral for Bush in Houston. The funeral at St. Martin’s Episcopal Church is also expected to include music from country music’s Reba McEntire and the Oak Ridge Boys. Following the service, Bush’s casket will be escorted by train to his presidential library in College Station for burial. The St. Martin’s Parish Choir performed “This is My Country” at Thursday’s funeral, which is the last public remembrance for the 41st president before his burial later Thursday during a private service at his presidential library in College Station. Bush’s longtime friend and secretary of state, James Baker, is set to give a eulogy, along with Bush’s grandson, George P. Bush. About 1,200 mourners were expected at St. Martin’s Episcopal Church for the service, which will include eulogies from Bush’s secretary of state, James Baker, and his grandson, George P. Bush. After the Houston funeral, a special train painted to resemble Air Force One will carry Bush’s casket, family and close friends about 70 miles (115 kilometers) to College Station, where he will be buried in a private service alongside his late wife, Barbara Bush, and their daughter Robin, who died of leukemia in 1953 at age 3.